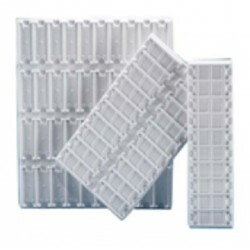 PVC Slide Staining Trays There are 3 products. White, 340x190mm, 20 positions Horizontal, white background for quick slide identification, recessed finger notches make slide removal easy. White, 340x100mm, 10 positions Horizontal, white background for quick slide identification, recessed finger notches make slide removal easy. White, 340x400mm, 40 positions Horizontal, white background for quick slide identification, recessed finger notches make slide removal easy.